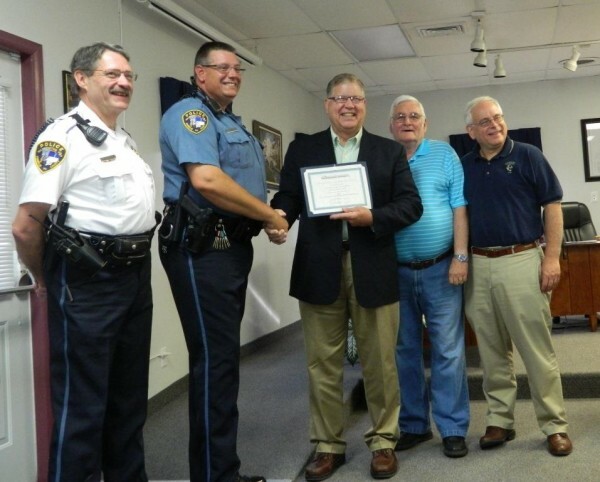 Receives Pennsylvania Aggressive Driving Law Enforcement Award. 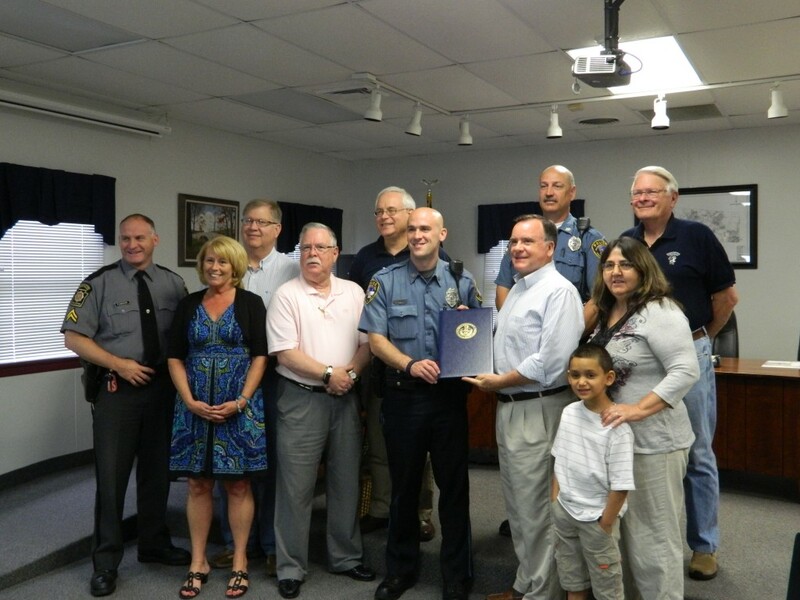 On June 22, 2017 members of the Washington Township Police Department, Washington Township Supervisors and the Pennsylvania Aggressive Driving Enforcement and Education Program gathered together to present Officer Stephen Shannon with an award for his efforts to reduce aggressive driving in Washington Township, Franklin County, PA. Officer Shannon was nominated by Washington Township Police Chief Barry Keller due to Ofc. Shannon’s willingness to work the aggressive driving special details which normally fall outside of Ofc. Shannon’s typical work schedule, and because Ofc. Shannon strongly believes in the program and demonstrates his belief by actively engaging in enforcement against aggressive driving. The Pennsylvania Aggressive Driving Enforcement and Education Program grants funds to Police Departments through out of the State after an in-depth application process. Washington Township Police Department has participated in the Aggressive Driving program since 2009, previously it was called Smooth Operator. The Aggressive Driving Program allows Washington Township Police Department the ability to conduct special traffic details within the Township to help provide enforcement and education for the serious problem of aggressive driving. Front Row: Washington Township Manager Jeff Geesaman, Washington Township Police Officer Steven Shannon, Washington Township Police Chief Barry Keller. Back Row: Chairman Washington Township Supervisor C. Stewart McCleaf & Law Enforcement Liaison North Central Highway Safety, Jeff Bowman. Officer John Brady receiving award from Chief Barry Keller. 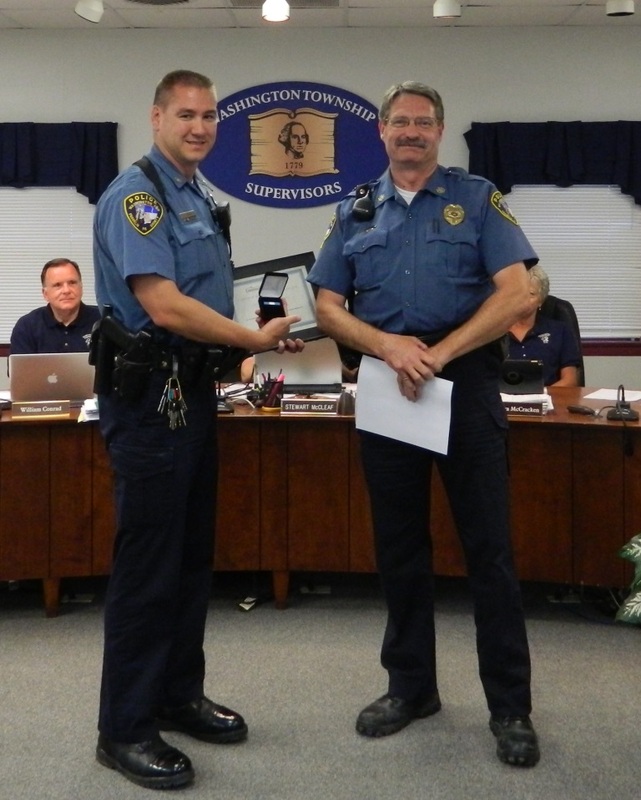 On September 9th, 2015, Chief Barry Keller presented to Officer John Brady of the Washington Township Police Department the 2014 PA Aggressive Driving Enforcement & Education Program award in recognition of his valuable contribution to the program in 2014. 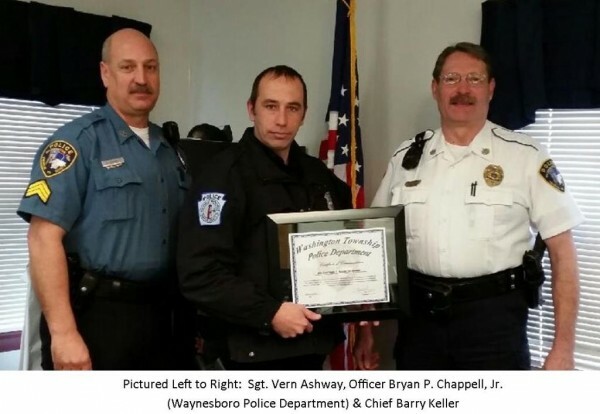 Washington Township Police presented Waynesboro Police Officer Bryan P. Chappell, Jr. with a Certificate of Commendation for his outstanding service to Washington Township Police Department on Nov. 7, 2014 with the apprehension of a bank robber who confessed to committing a total of 5 bank robberies in the area. and Michael A. Christopher – Township Manager. 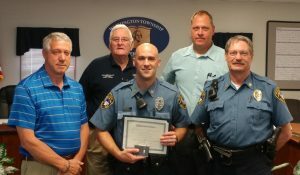 On June 6, 2013 Officer Stephen W. Shannon receives citations from the Rep. Todd Rock and state Senator Richard Alloway II and recognition from the Pennsylvania Department of Transportation for his outstanding service in performing the Pennsylvania Aggressive Driving Enforcement and Education Program. L-R (front row): Cpl. Flanagan – Chambersburg State Police, Barbara Zortman – Co-Coordinator of Aggressive Driving Enforcement Education , Officer Stephen Shannon, Supervisor William Conrad, Supervisor Elaine Gladhill and her grandson Raidan Crisler-Smith. L-R (back row): Lindsay Deppen – Law Enforcement Liaison for Buckle Up PA, Michael Christopher – Township Manager, Sgt. Vernon Ashway, Supervisor Richard McCracken.